One of our unique exotic patients, a panther chameleon. 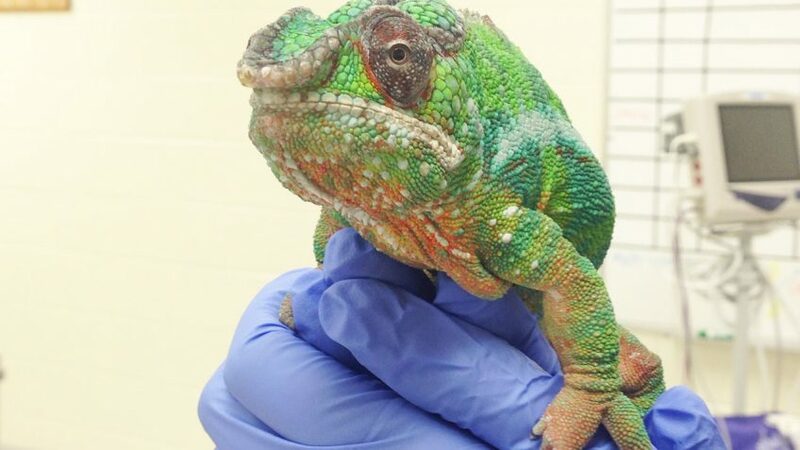 They’re perhaps not the cuddliest creatures to come through the NC State Veterinary Hospital doors, but reptiles are a big part of the work — and welcome faces — at the College of Veterinary Medicine. Since today is Reptile Awareness Day, set aside to celebrate all the snakes, lizards, frogs and turtles in our lives, we asked Tara Harrison, a clinical assistant professor, to reveal some of her favorite stories of working with reptiles at the CVM. Harrison, whose research focuses on preventive medicine and treatments in exotic and wildlife species, is a reptile lover outside of work. She has two pet red-eared slider turtles, Lucy and Bob, at home. 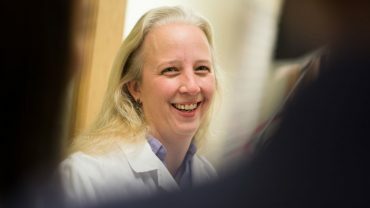 We’ll let Dr. Harrison share her story. Dr. Tara Harrison: “I have always loved reptiles. In fact, one of the reasons I got involved in exotic animal medicine is because I was allergic to anything with fur. One of my first personal pets were some rescued red-eared sliders that became my “fish” in college. Now a different set of turtles are a part of the pets in my household and they have made frequent visits to my children’s schools. I was very excited to come to NC State where we have a large focus on turtles with the student and volunteer-run Turtle Rescue Team, which I am a part of. We also work with the NC State Center for Marine Sciences and Technology (CMAST) and the Karen Beasley Sea Turtle Rescue and Rehabilitation Center. As part of that, I have become involved in using new technology to see if cold laser therapy will aid in healing turtles affected by being cold-stunned, when they are exposed to cold water temperatures for a long time, similar to hypothermia. Cold laser therapy is a new technology that aids in healing turtles affected by being cold-stunned, when they are exposed to cold water temperatures for a long time, similar to hypothermia. 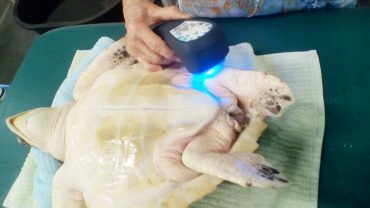 In working with the rescue group and Craig Harms, CVM aquatics, wildlife and zoo medicine professor and director of CMAST’s marine health program, we are instituting this therapy using Multi Radiance MR4 cold laser on turtles affected by this past season’s cold-stunning event — and to prepare for this winter. We hope to be able to decrease the time the animals are in rehabilitation through the use of this unit. Additionally, we are using the same cold laser with turtles the Turtle Rescue Team receives that have shell trauma, studying to see whether the cold laser speeds healing time. As part of my studies in acupuncture, turtles were the first to be evaluated through the use of acupuncture points to evaluate if it will enable them to wake up from anesthesia faster. As you can see, I truly appreciate turtles — and not just on Reptile Appreciation Day. One of my most memorable experiences with a reptile? One of our patients showed up in an Xbox box for an exam. It was a panther chameleon and that was its travel case! It has continued to teach me that there are many different ways to transport your pet.